I guess the egg [salad] came before the chicken [salad] after all! (ha-ha). But seriously, this chicken salad is quite refreshing and almost floral tasting with the addition of tarragon and grapes, perfect for this hot and muggy weather we’ve been having! I totally agree with Amy on the mayo-based salad point — I mean who knows how long those have been sitting in their little containers at the grocery store or out under those steamy glass panels… much better to make them yourself. This recipe is based off of Ina Garten’s, but lightened up with some non fat greek yogurt. Preheat your oven to 400 degrees. Place the chicken breasts skin side up on a sheet pan, brush with olive oil, and season liberally with salt and pepper. Roast for 35-40 minutes or until cooked through. Allow the chicken to cool, then remove the skin and dice into small bite sized pieces, about 1/2 inch. Combine the mayo, yogurt, and chicken in a large bowl and mix thoroughly. Add the tarragon and grapes and season with salt and pepper to taste. Enjoy as is or in a wrap or sandwich! 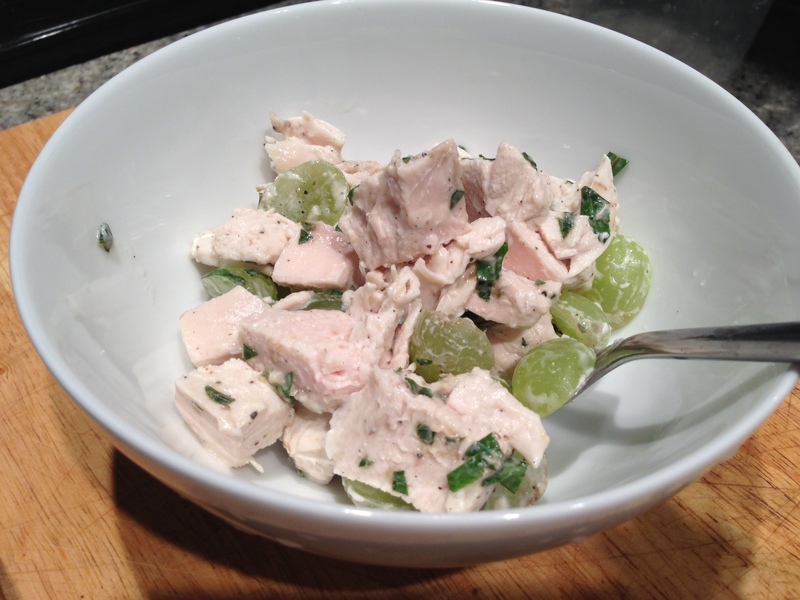 This entry was posted in Chicken, Salad, Tarragon, Yogurt and tagged chicken salad, chicken salad veronique, grapes, lunch, summer, tarragon. Bookmark the permalink.